Musical America Blogs » Blog Archive » Candidate Nelsons? « Good News for the Radio Orchestras? MUNICH — An odd thing happened during the curtain calls last evening after a taut, riveting Rusalka here at Bavarian State Opera. The orchestra players made various signs of approval for the cast members’ work, as is customary, and then essentially none for the conductor (and leading lady’s husband). Their coolness was the more noteworthy given that Andris Nelsons was making his company debut. Cheers from the house reflected the strength of the performance. Why would this be? Nelsons is im Gespräch for Kirill Petrenko’s job, and perhaps the players aren’t ready to have their future mapped out so soon after the Berlin Philharmonic’s poaching of their GMD. Petrenko has, after all, lifted them artistically from the twenty-year trough that was Schneider–Mehta–Nagano. Besides, his exit will grind along in slomo, with the vacancy not opening until Sept. 2020 and a substantial guest-conducting presence for him through the season that starts that month. Then there is the irksome whiff of pre-planning. In 2015 the Boston Symphony Orchestra oddly replaced its two-year-old agreement with the Latvian maestro with a partly retroactive one for 2014–2022. An “evergreen” clause in this continues its effect for a defined period unless it is canceled within a stated time, ipso facto picturing such notice. Months after signing it, Nelsons moved with his daughter and wife, compatriot Kristine Opolais, the Rusalka star, to Munich’s Bogenhausen district, within walking distance of BStO, Germany’s largest opera company. (It was in opera that Nelsons launched his career, in Riga.) At the same time, he accepted a second orchestra job, with a Feb. 2018 start, in Leipzig, just three hours north of here by train. At least one listener went to the performance not expecting revelations from the newly resident conductor. Tomáš Hanus had presented Dvořák’s score so lyrically and so urgently at the 2010 premiere of Martin Kušej’s wayward staging — which not incidentally propelled Opolais to fame, thirty years old and a year into her marriage — as well as on DVD and in seasons following, that it seemed nothing more could be said. But Nelsons remolded it entirely, galvanizing long, long, telling lines that penetrated beyond the frames of the acts and into the musical silence of intermission. 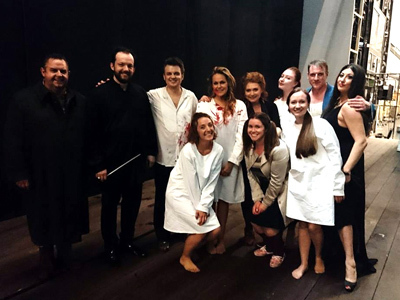 Pictured from the Dvořák cast are: Ulrich Reß, Nelsons, Dmytro Popov (a rich-toned Princ), Opolais (still an endearing Rusalka), Helena Zubanovich (a Ježibaba voiced to peel the silk off the walls), Alyona Abramova, Günther Groissböck (the almighty Vodník) and Nadia Krasteva (the enticing Cizí kněžna); front: Rachael Wilson, Tara Erraught and Evgeniya Sotnikova. This entry was posted on Friday, June 16th, 2017 at 4:57 pm	and is filed under Munich Times. You can follow any responses to this entry through the RSS 2.0 feed. Both comments and pings are currently closed.